It’s hard to miss a brightly painted building while driving down Plainfield Avenue on Grand Rapids northeast side. That building is even harder to miss if it has the word “BBQ” painted on it. That’s the case with Bro’s BBQ and Ice Cream in the old Frosty Boy on the corner of Plainfield and Ann Street. 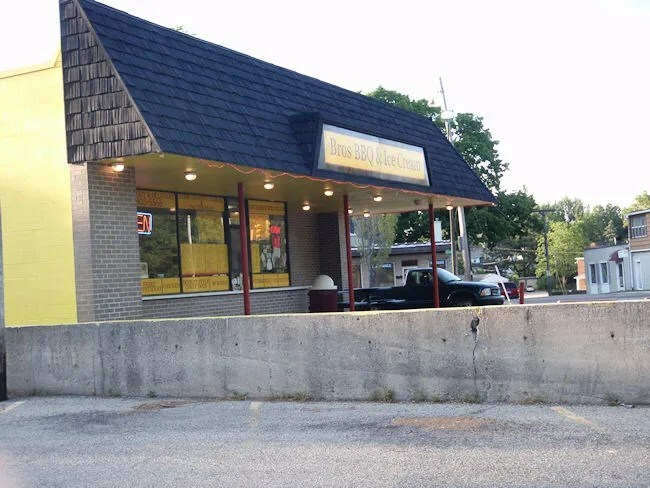 After GRPS gave up on tearing the building down, the mastermind’s behind Bro’s BBQ approached the new owner with their concept. After a lot of renovation and getting a building that sat empty for almost six years. I was downtown working on something when I realized I hadn’t eaten dinner. There are plenty of great options in downtown Grand Rapdis, but I was in the BBQ mood. I figured it was about time I stopped in at Bro’s. I wasn’t the only in the BBQ mood. The small parking lot at the walk up restaurant was full. The line gave me some time to look over the menu. I didn’t really need the time because what I wanted was the pulled pork sandwich. When it was my turn to order, I ordered the pulled pork combo. Then, it was disappointment time. They were out of pulled pork…..and macaroni ‘n cheese. I really wanted BBQ which was the reason I drove to Bro’s, but I didn’t really want to do rib tips. I just gave up on this trip and ordered the Bacon Cheeseburger combo instead with the 1/2 fry option and a Pepsi. They accept credit, but I had cash on me and the bill was only a little over $5 so I paid for it that way. After paying, I moved down to the pick up window to wait for my food. They were experiencing quite a rush when I was there and all the food is made from scratch so there was about a ten minute wait or so while the two cooks worked on the orders ahead of mine. A few minutes later, my burger and fries were boxed up and put in a paper bag then handed through the window with my Pepsi. There are a few picnic tables on the property, but for the most part, Bro’s is a carry-out place. I needed to get back to work anyway, so I headed for the car and back down Plainfield towards downtown. 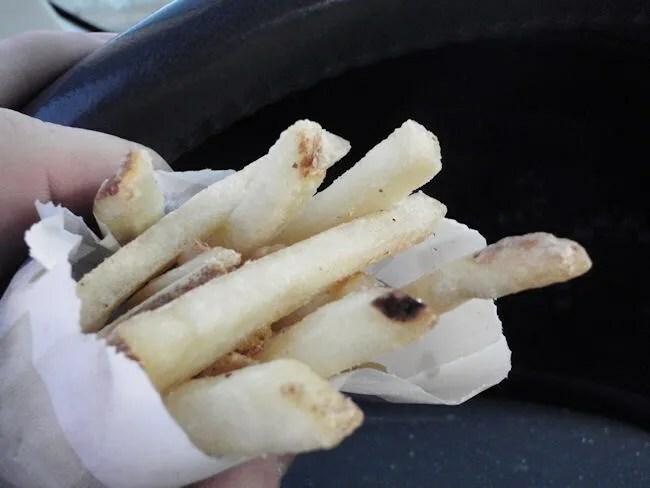 I reached in the bag and pulled out the fries while I was driving. I was happy to find skin on potatoes, but they were a little under done. They were salted nicely, but still had a little bit of a raw potato taste in the middle. I didn’t crack open the Styrofoam box with the burger until I was back at my desk. 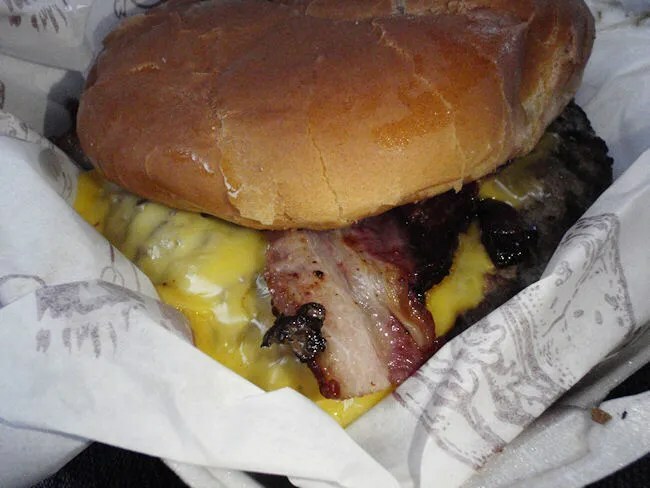 The burger had that really great greasy diner taste to it with crispy bacon and a toasted bun. It was topped with ketchup, mustard, and pickles which I actually didn’t mind. Usually I would scrape that stuff off, but I just went with it. The condiments didn’t overpower the good stuff, so I was good with it. 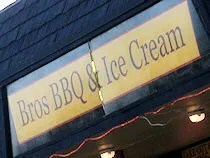 I’m a little disappointed I didn’t get the BBQ at Bro’s BBQ and Ice Cream that I was hoping to get. Guess I’ll just have to go back some other time. What I had was delicious and they try to source local suppliers for as much as possible. Always a good thing.